CAIRO (AP) — As Egyptians mark the third anniversary of their spectacular revolt against autocrat Hosni Mubarak in the name of democracy on Saturday, there has been a powerful sign of the country's stunning reversals since: letters of despair by some of the prominent activists who helped lead the uprising, leaked from the prisons where they are now jailed. The letters show a battered spirit, no longer speaking of imminent democracy, but of injustices and a failed struggle that they say has been robbed repeatedly. "What adds to my feeling of oppression is that I feel this particular lock up has no value. This is not struggle, and there is no revolution," wrote Alaa Abdel-Fattah, one of the most prominent figures in the 2011 uprising. He was jailed several times in the past and was taken back into detention in November for calling for protests against Egypt's current, military-backed government. The 18-day uprising launched on Jan. 25, 2011, rode on hopes for dramatic change in a country long ruled by an iron grip — for an end to corruption and police power, for freedoms of speech and political rights and for greater economic equality. 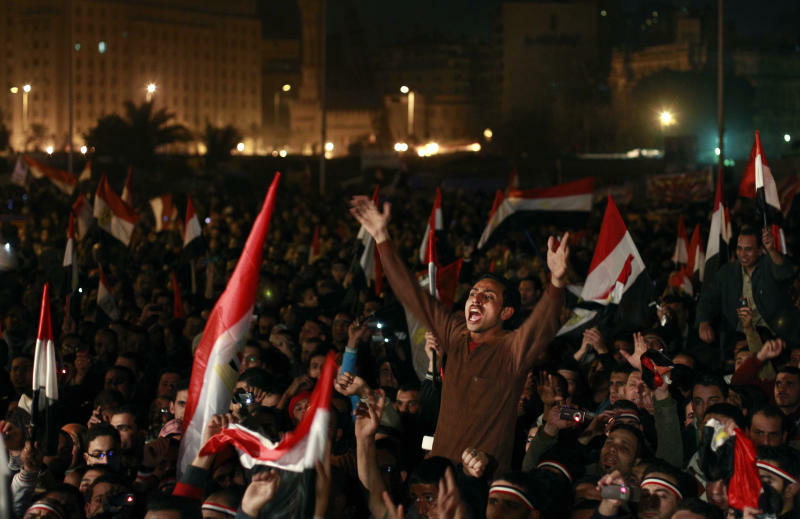 Those hopes went largely unfulfilled in the ensuing political roller coaster, as a council of generals took power for nearly 17 months after Mubarak's removal, and a string of elections brought Islamists to political dominance. Their rise was crowned by the 2012 election of the Muslim Brotherhood's Mohammed Morsi as president. Now the "Jan. 25 Revolution" has been swallowed up by another mass movement: The "June 30 Revolution," named for the giant wave of protests starting on that date in 2013 against Morsi. It erupted after many Egyptians became convinced he and his Brotherhood had violated the dream of an inclusive, democratic Egypt. 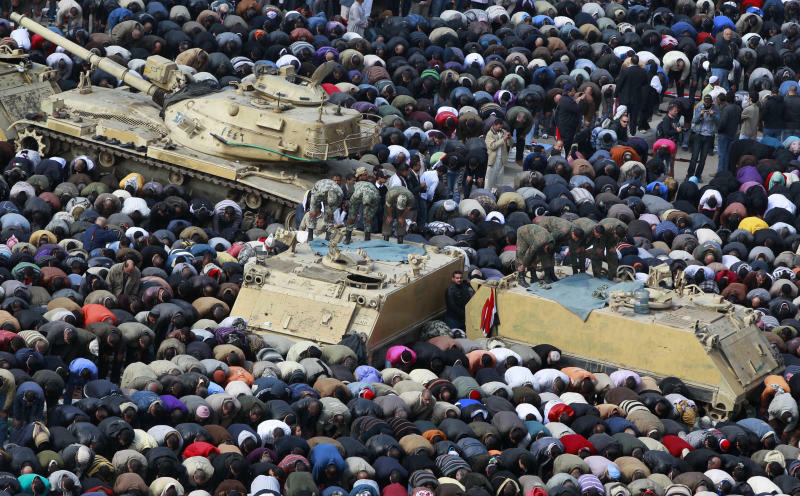 The millions in the street prompted the military to remove Morsi within days. The demand of the June 30 revolt has become to restore stability, bringing together a military-backed government, the powerful police agencies and a broad sector of the public determined to crush Islamists they believe conspired to wreck the nation and change its identity. 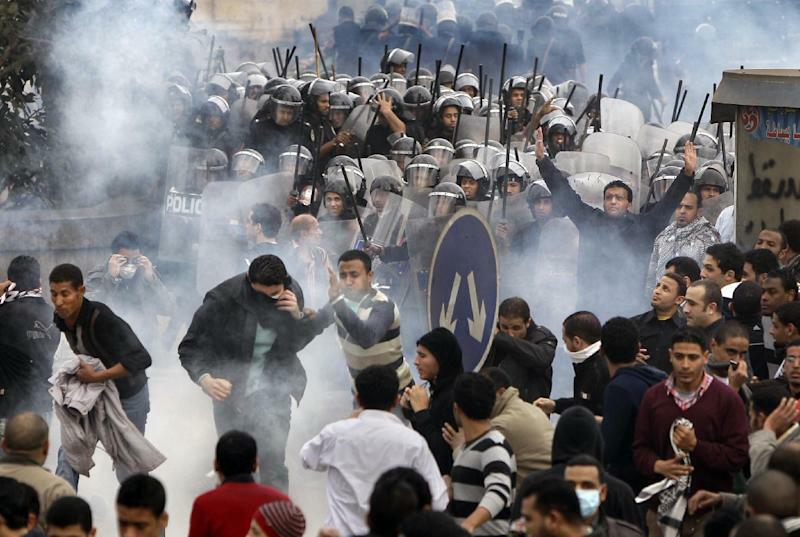 Security forces have arrested thousands of Brotherhood supporters and killed hundreds. At the same time, the Brotherhood and its Islamist allies have adamantly stuck to a campaign of protests demanding Morsi's reinstatement — a virtually impossible goal that the group vows it is willing to risk destruction to achieve. A campaign of violence by Islamic militants, apparently a backlash to the removal of the first Islamist leader of the Arab world's largest country, only has heightened the public fears fueling the June 30 movement. A string of bombings against police on Friday, particularly a dramatic truck bombing that smashed Cairo's main security headquarters, killed six people and intensified a public backlash against the Brotherhood. Police and angry residents clashed with Brotherhood protesters around the country, leaving 14 more dead. Both sides are determined to use Saturday's commemoration. The Brotherhood wants to build momentum for its protests, which have dwindled under the crackdown. Supporters of the military are coming out to urge the head of the military, Gen. Abdel-Fattah el-Sissi, to run for president in elections this year and save a country they describe as in a state of war. The activists behind the 2011 uprising are squeezed between them— as they have been from the start. The authorities' campaign against terror has expanded into arrests of others showing dissent. Secular critics of the government are branded in the media as traitors and Brotherhood sympathizers at worst. "For the second time since the fall of Mubarak in February 2011, a government is in power with little apparent inclination to limit itself by respecting basic rights," Human Rights Watch said in its annual report released earlier this week, referring to abuses by both Morsi's government and its successor. The government shrugs off criticism, saying it is intent on pursuing democracy while stressing it is waging a war on terrorist groups. This month, it pushed a revised constitution through to adoption in a public referendum. Ostensibly more liberal-leaning than the previous one adopted under Morsi, it upholds equality for women and Egypt's Christians and guarantees political rights, but entrenches the power of the military as an institution above oversight. "We are continuing our march to the future," presidential adviser Mostafa Hegazy told a press conference Tuesday. "As much as you've seen clockwork when it comes to the constitution, you'll be seeing clockwork when it comes to the presidential and parliamentary elections" expected by this summer. The youth groups at the heart of the Jan.25 uprising are in disarray. A few continue protests calling for more freedoms. Other groups are abstaining, refusing to join ranks with Islamists. For Abdel-Fattah, the activist and blogger arrested from his home in a night raid in November, his latest imprisonment was a sign of the "miserable" state of their revolt. In a letter to his two sisters, also activists, published by one of them earlier this week, he says he spends most of his day in solitary confinement. Ahmed Maher, founder of the April 6 movement that led protests against Mubarak before and during the 2011 uprising, wrote to his children a letter published on the group's website. He is serving a three-year sentence for violated a law enacted in November that virtually bans protests. "I don't know, kids, why I am in prison?" he wrote. "I didn't steal. I didn't kill or rob the country like Mubarak and his cronies did. I didn't kill protesters and I was not a police officer who tortured people. You will hear in the media one day that your dad is a traitor, an agent who receives money and you will study in history that your dad had a prime role in the January 25 'setback'. That is what they call it now." "Everything collapsed," he wrote. "And instead of your generation reaping the fruits of Jan.25, it is now up to you to start anew after Jan. 25 was exterminated." Still, Jan. 25 earned many a voice they say they are not ready to give up. "When the revolution happened, I felt that the country was mine. I felt my value," said Ayman Hegazy. "We were men when we stood up to injustice." The 32-year-old sports a beard typical of ultraconservative Salafi Islamists but is a moderate, critical of the Brotherhood, the military and the Mubarak era. He survived one notorious disaster of the Mubarak era — a giant rockslide that crushed homes in Cairo's Dweika slum in 2008, killing dozens. During the 2011 uprising, he was injured in clashes with police and Mubarak loyalists, then jailed for a month after clashes with police under military rule later that year. Now living in new government housing in Dweika, he runs a popular committee set up after the revolution to fight corrupt local officials and demand services. He said the country has gone full circle, with Mubarak cronies trying to resume their place in power and the military and police more powerful than ever. But he said he will continue protests. "I know I may be arrested. I know I may die," he said. "I have friends who died, who lost their eyes or are detained. I can't be at home, and sell them out." And after the despair of his earlier letters, Abdel-Fattah sought to show he had not given up, publishing a testimony late Friday that he and fellow activist Ahmed Douma said they wrote together, shouting between their cells. The joint long document, a combination of text and poems, is a confession of their own errors and criticism of others, offering a window into the thinking of a generation of revolutionaries shaped by of three years of messy politics. "It is a betrayal to hope, just as it is to despair," he wrote. "Here in my cell, I wrestle with my dreams and nightmares — I don't know which is worse. ... But I will never betray."